Small Businesses get it wrong. Many think that because they are small, they have less to offer their new hires than the big companies. Because of this, they often settle instead of pursuing the great hires they need! Even job seekers can fall into this trap. 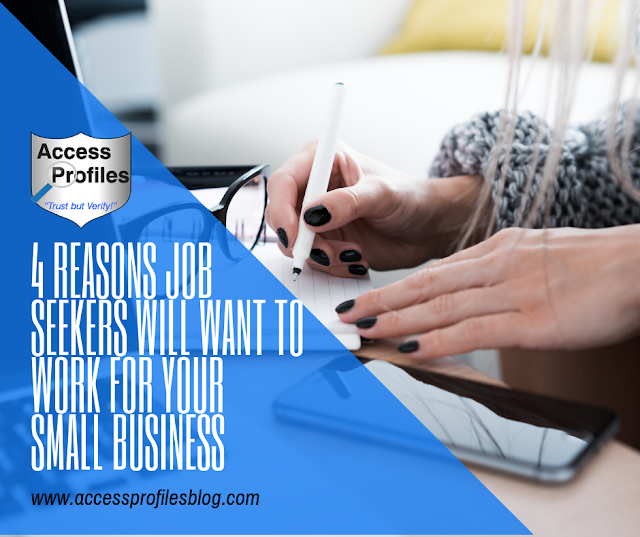 Most often their goal is to work for a large company, often without even considering working for a small business. They can’t see the benefits that a small business can bring to their level of experience and confidence. It is time to change that mindset. While it is true that some small companies may not be able to offer the salary associated with working for big business, they can offer many other things that can create a valuable working experience. Working for a Small Business can offer you something different. By nature, a small business atmosphere is more hands-on and close knit. Employees have a much more tangible stake in the success of the company and often have a chance for greater input. Even flexibility of work hours, telecommuting, and promotions are often part of the small business culture. The success of small companies relies on flexibility. Their success depends upon being able to adapt quickly to changing external and internal forces. And their employees learn can learn a lot from this ever-changing environment. Small business employees have the opportunity to learn many roles. Strict adherence to job titles and work responsibilities is not often practical for companies with fewer employees. 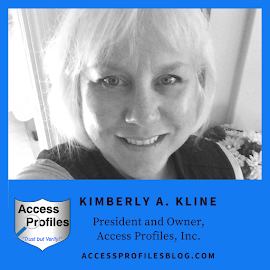 This allows for more job responsibilities and the chance to really make a difference ~ a great resume and career builder. The collaborative and nurturing characteristics of small business are also a plus for employees. It is a chance to really get their voice heard and to get their ideas implemented much sooner and more often than will occur in a larger company. As a small business owner, are You finding yourself losing out on great talent because you can’t compete with the “big boys”? Then it is time you sell the real advantages of working for a small business! In large companies, job titles and job duties are often clearly defined. This is less common in a small business where an employee has the opportunity to wear different hats. This is especially valuable to an employee that may be uncertain of where their interests really lie. The chance to explore different avenues is rarely a part of big business culture, at least for new hires. With less people to rely on to get the job done, small businesses count on their employees to make decisions and take on more. Employees learn to work independently at an early stage. In turn, management is more apt to listen and implement their employee’s ideas. This level of responsibility and decision-making are invaluable to building a strong resume. Having the opportunity to do this in the early stages of a career is especially rewarding. With added responsibility comes the chance for employees to really get credit for the work they do. A smaller number of workers allows hires to work more closely with their boss and get noticed. This is often not possible in a larger company. Getting recognized for good work and tangible contributions to the companies success can lead to even more responsibility, raises, and promotions. Many small businesses are more casual. Employees may work from a small storefront, the owner’s home, or even out of their own homes. This non-traditional atmosphere usually results in things being much more laid back. Even things like lunch, breaks, and start/stop times may be less rigid. This often translates to more relaxed dress codes also. 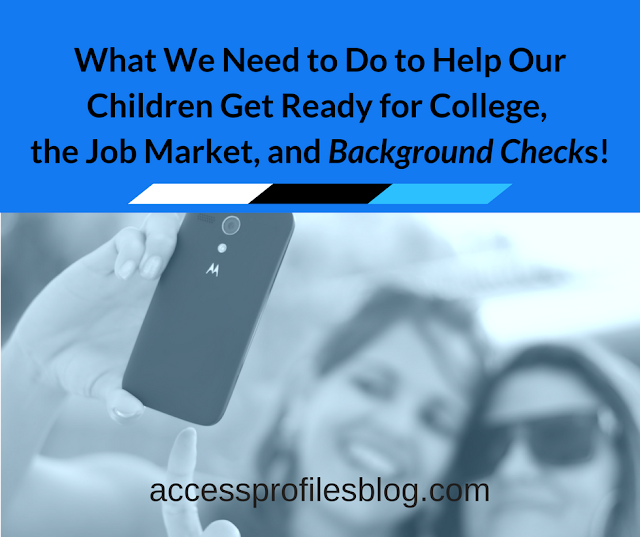 This more casual atmosphere can appeal to new, and often younger, job seekers. Small Businesses are also more intimate. While this may not appeal to all, the chance to work where “everybody knows your name” can be a great draw. Forging close working relationships is a fantastic way to gain valuable connections and learn skills from those around you. It can even lead to an important pool of future references. Vacation time and Flex time ~ both are especially attractive to new hires. If at all possible, offering 2 weeks vacation is a great draw to job seekers. Knowing that you place value and importance in their “down time” goes a long way towards an attractive company culture. This goes the same for allowing flexible start times and telecommuting. Both enable your employees to combine their work and family life with less stress. Having the chance to work from home and start at a time that allows for school schedules and snow and sick days can make all the difference in getting and retaining quality hires. In addition to creating a great company culture and atmosphere, giving your employees a fair and competitive wage helps attract and keep them. Offering the best you can afford is the way to start. Good health benefits also goes a long way towards gaining the loyalty of your employees. By all means shop around for the best deal, but skimping here and on wages will not help you in your quest to gain top talent. Bonuses for quality work are key. While bigger companies may wait for the routine holiday bonuses, as the owner you can offer them any time. Your employees will really appreciate the timely recognition and it will make others strive to succeed. Other perks like local restaurant or store gift cards, company sponsored “Friday Lunches”, or even an occasional golf outing or some other group activity, are some easy ideas that won’t break the bank. These benefits and perks should be at the front and center of your marketing campaign to attract new employees. Be sure to emphasize what you and your Small Business can offer. 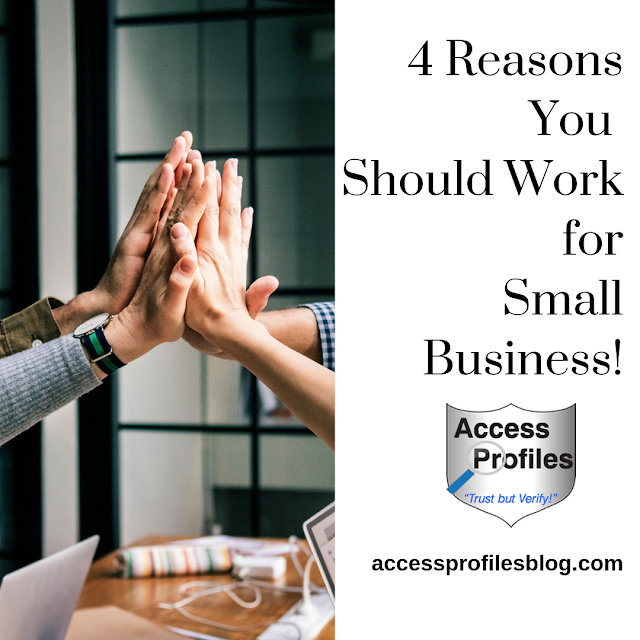 Flexibility, the opportunity to add quality skills and responsibilities to their resume, and a feeling of partnership in your success are definite draws to working in a Small Business. And it is Your Responsibility to create an atmosphere where these things are possible. Just be sure to spread the word! Start by sharing and commenting on this article. It is a great way to get the benefits of working for a Small Business out there. Thanks! We are dedicated to helping your Business succeed. Contact Us Now to find out more. About Us & Our Background InvestigationServices too! Most definitely Ann! I think this is one of the biggest "perks" for sure! Is Code Spark a Small Business? Would love to hear what you do!